Celebrating Singapore Shores! 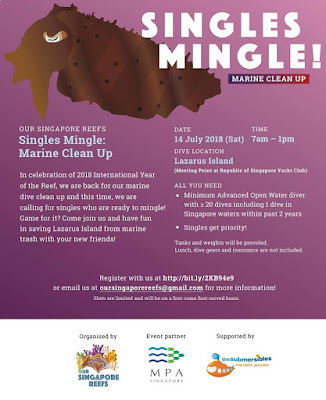 : 14 Jul (Sat): Our Singapore Reef's Singles Mingle: Marine Clean Up! 14 Jul (Sat): Our Singapore Reef's Singles Mingle: Marine Clean Up! In celebration of 2018 International Year of the Reef, we are back for our marine dive clean up and this time, we are calling for singles who are ready to mingle! Game for it? Come join us and have fun in saving Lazarus Island from marine trash with your new friends! Register with us at http://bit.ly/2KB94e9 or email us at oursingaporereefs@gmail.com for more information! Lunch, dive gears and insurance are not included.